Morning all, It's time again for the weekly Tuesday Color Challenge over on Outlawz Challenges. I had fun making this card, it went to my BF for her Birthday. I even tried to color the cat spotted like he really is..... 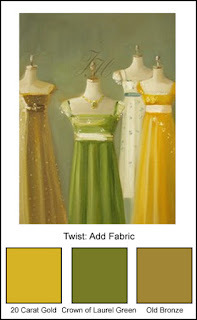 So here are is the color palette for this week and the twist was to add fabric. I used some old lace fabric and added some gold color to it. I like the finished product, what about you all, How did I do? Here it is. The digi is called "Gifts Galore" and can be purchased over at The Stamping Shack. They have some of the darn cutest digi's around! That's all for today. Have a fun one. Sweet design, Chris. Terrific bow. Thanks for guest designing with us this month. It is great to see your talent. Super cute image Chris and your desing is fab - I love that lace bow, gorjuss! !